While it’s true that Costa Rica may not be as inexpensive as it was a decade ago, it’s still very affordable, and much less expensive than say Austin, Texas and Honolulu, Hawaii—two places I lived before moving to Costa Rica. There are definitely still many affordable destination gems to be found—particularly if you live in the smaller, quainter towns than in the larger, more touristy areas.That wasn’t a difficult choice for me anyway. I personally find the former much more attractive than the latter, as they are more peaceful, majestic, and pristine; and in general, less expensive. 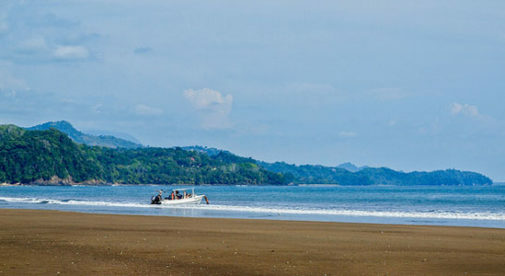 Take for example the small neighboring, rural beach communities of Playa Avellanas and Playa Negra. There I recently found a two-bedroom, one-bathroom, 900-square-foot, stand-alone cabina for $450 per month. This includes a full kitchen, tiled bathroom, high-speed Internet, and washer and dryer. A bonus is the cabin is set on an idyllic organic farm with fruit trees. If you take advantage of the local ferias, or farmers markets, which can be found throughout the country every weekend, you can stock up on fresh fruits, vegetables, and other staples such as potatoes, beans, rice, and free-range eggs—all for much less than you’d pay in a U.S. grocery store. The largest expense (if you don’t want to rely on public transportation) would be purchasing a vehicle, which would cost about the same or slightly more than in the U.S. However, since every other expense (e.g., rent…utilities…phone…a cup of coffee…food) is less expensive, you still come out ahead. You might even consider buying a motorcycle here; for a while, it was my main method of transportation and very affordable. If you live in an area where there is public transportation and a few restaurants within walking distance, you can easily go without a car in Costa Rica. Public transportation is reliable and incredibly affordable. For example, a one-and-a-half hour bus ride from Playa Avellanas to Santa Cruz costs me a mere $1.50 one way. 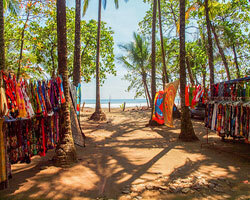 The smaller, quainter towns in Costa Rica, like Dominical, are still very affordable and breathtakingly beautiful. If you want to live a little more on the beaten path—for example, in a community mixed with locals and expats—you could try the small, but slowly growing, town of Dominical. While this Pacific beach town consisting of a main road dotted with restaurants, shops, and small markets doesn’t offer much in the way of monthly rentals (except for hotels and hostels), the neighboring and charming towns of Uvita and Ojochal have plenty of houses for rent ranging from $400 to $700 per month, with equally stunning landscapes and beaches. If you’re willing to spend $1,000 per month in rent, you can get a very nice three-bedroom villa in either town. The abundance of pristine nature and outdoor activities, wildlife, overall safety, friendliness of locals, and ease of transitioning to a foreign country (many people speak English) makes Costa Rica a very desirable place to live. Couple that with the ability to live comfortably on $1,000 per person a month, and you’re in paradise!